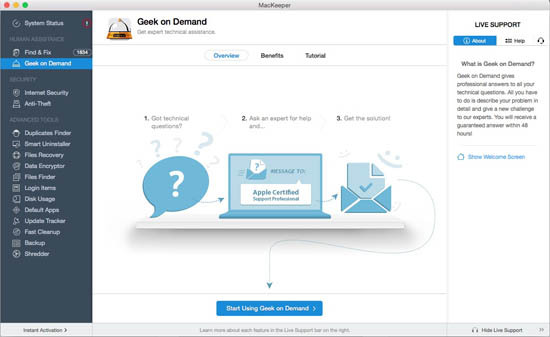 This unique feature offers the service of an Apple Certified Support Professional at your disposal. This means that you can immediately find easy solutions for any kind of issues you face. 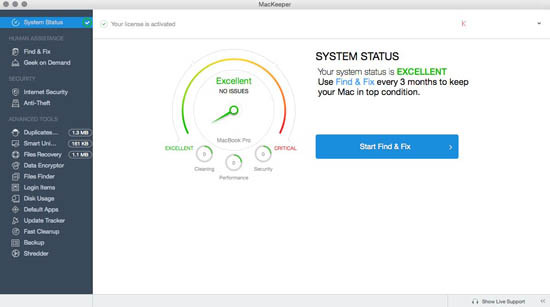 MacKeeper scans the machine for junk files, performance discrepancies and security threats regularly. Based on the scan result, it creates and transmits an error report to the remote Mac expert for an immediate resolution. It also incorporates live chat and Geek on Demand features, with which you can chat with Apple Certified Support professional 24X7 to get expert opinion regarding the health of your Mac system. In addition to this, the company provide seamless phone and email support. The MacKeeper comes with an array of sophisticated cleaning tools to keep your machine as fast as it can be. The tools includes memory cleaner, Fast Cleanup, Smart Uninstaller, Duplicate Finder and many more. Memory Cleaner: The Memory Cleaner is one of the most useful tools in MacKeeper. It monitors your Mac while you are working with it and automatically optimizes the system for better performance. It lets you scan the inactive memory of your machine and clean it with a single click. Memory Cleaner also allows you to schedule automatic cleanups from the advanced options and the MacKeeper will keep your system clean without your interaction. Fast Cleanup: This feature will let you delete unnecessary files that may consume the hard-disc space and slow down your Mac. It can remove temporary caches, unwanted language packages, logs, installation files etc and free up hard-disc space quickly and easily. This utility includes four components such as Cache Cleaner, Binaries Cutter, Languages Cutter and Logs Cleaner. Smart Uninstaller: Uninstalling a program is pretty simple in Mac, you can do it by dragging the application icon to the trash. However, when you remove an application in this way, many of its associated components such as its caches, widgets, plug-ins, preferences and logs stay behind on your system. These files are of no use and just a waste that consume your hard disc space. Here the Smart Uninstaller in the MacKeeper can do a great job by providing a complete un-installation. When you uninstall an application using Smart Uninstaller, not only the main program files, but also its associated files are deleted from your system, and there is nothing left over to consume the hard disc space. It is also faster and safer than the standard uninstaller. Duplicate Finder: It is quite common that the computer contains duplicate files. It is virtually impossible to manually find and delete them as the file names can be different though the data is identical. The Duplicate Finder is a powerful tool that can help you find all duplicate files including documents, images, media files, emails and many more. It is amazingly fast and accurate, and it will list the duplicate files and delete them upon your approval. This tool can make your System clean and organized by recovering lot of space in your hard-drive. Bootup Booster: The advanced tools in MacKeeper allow you to take control over the applications that launch every time you boot your system and thereby reduce the boot up time significantly. In the Login items menu, the MacKeeper will show you the list of applications and agents that startup with the Mac and you can easily manage them with just one mouse click. 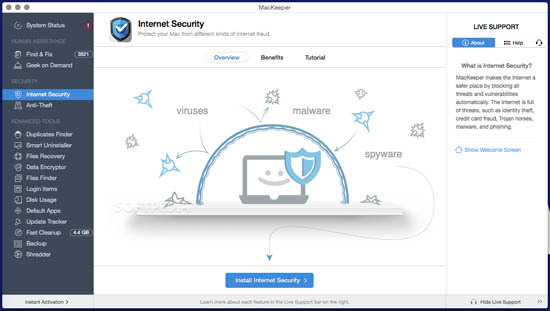 Update Tracker: The MacKeeper frequently check for available updates for the software installed in your system and will never let you miss an important software update or a security patch that can improve the system performance. The advanced security features in MacKeeper provide unmatched protection to your machine both online and offline. It protect your system from Mac and Windows viruses, Mac Spyware, identity theft, phishing attacks, email threats etc. The Safe Browsing feature with real-time protection enables you to surf securely by blocking all malicious websites automatically. You can also manually assign a list of potentially dangerous sites that need to be auto-blocked and the MacKeeper will do the rest for you. It comes with the powerful Avira antivirus engine and provides best in class protection. The Safe Browsing feature is compatible with all popular browsers including Chrome, Safari and Firefox. With the foolproof anti-theft technology, MacKeeper frees you from the worries of data breach due to a stolen or lost Macbook. From your Kromtech account or the Track My Mac app in your iPhone, you can track and remotely lock the missing computer. The MacKeeper will send the geo-location and the network details along with an iSight snapshot of the current user to your account. The company has alliance with the investigation agencies around the globe, and with the help of location report and iSight snapshots it is much easier than ever to locate your lost machine and bring it back home. The MacKeeper comes with many useful tools that are highly useful in our daily life. Data Encryptor: This is a very useful tool when you share your machine with someone else. It will help you to encrypt and hide the sensitive files so that no one else can access them even with a Finder or Terminal. Files Finder and Shredder: File Finder can search and locate any misplaced or lost files even if you forget the storage location. The predetermined search parameters make the process easy, and you can use it to find audio, video, documents, archives and application files. The File Shredder is another powerful tool, with which you can delete any file permanently so that it cannot be recovered even by using any special data recovery tools. Files backup: The MacKeeper offer you the facility to backup all your important files to a destination of your choice. It can be a USB flash drive, external HDD, or an FTP and the user-friendly interface make it easy to create a reliable backup of the files you have selected. Files recovery: This is another tool in MacKeeper that can be used to restore the files or data you deleted unintentionally.